Wandering around Somerset County gave us the chance to visit one of my favorite, "Wow, this is New Jersey?" 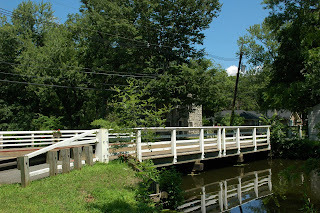 destinations, the Delaware and Raritan Canal at Griggstown in Franklin Township. I discovered it a few years ago on one of my dreary-winter-day drives to nowhere, and it seems to be one of those places that's beautiful during every season of the year. For some reason, I never actually consult a map for my trips there. I generally drive by internal GPS, knowing that if I stay on the Canal Road with the canal in sight, I'll eventually get to my destination. Today, there are enough houses and traffic on the road to make the place feel populated, but back in the days when the canal was the focus, Griggstown must have seemed like one of the few bustling points between Princeton and New Brunswick. Most parts of the canal don't have much in the way of contemporary structures, but here many buildings were constructed to serve its operation. A combination mule drivers' barracks and barn still stands, as well as a lock tender's house and a few other stone structures of indeterminate purpose. There's also a small bridge tender's station at the foot of the wooden Griggstown Causeway crossing the canal and adjacent Millstone River. Originally a mill town, Griggstown also hosted a copper mine which operated on and off from 1790 to the early 20th century. The community also saw its share of notables during the Revolution, as Washington marched troops through after the Battle of Princeton and Rochambeau led his troops through on the way to Yorktown. As for us, we just wanted to take a stroll, maybe see a few birds and enjoy a sunny afternoon after tackling the Sourlands. Parking at the lock tender's house, we took to the tow path with the intention of walking to back to the Causeway. We didn't run into too many other walkers, but there were plenty of cyclists and runners capitalizing on the soft, level surface. From the looks of things, a few horses had likely been there, too. The birds were fairly quiet, given that it was already mid-afternoon, but a chickadee or two obliged Ivan with a quick view. Just east of the Causeway there's a canoe and kayak rental, though we didn't avail ourselves this time around. It didn't seem to be too buggy at all on the water, so it might even be an option for a return trip in August.